This year, avid cyclists in the media and marketing industry will have a chance to join Team UnLtd. Members will receive free entry to the event (valued up to $240), a special edition yellow jersey to wear on the day, exclusive pre-event training dates with fellow adland cyclists and special events at the Event Village. All riders for Team UnLtd must commit to fundraising a minimum of $1,000 to UnLtd with funds to be distributed to UnLtd’s carefully selected charity partners working hard to undo youth disadvantage in Australia. If you’ve ever dreamt of the glory of cycling your way to a yellow jersey, get in touch now (saarika@unltd.org.au) to book one of the limited spaces. 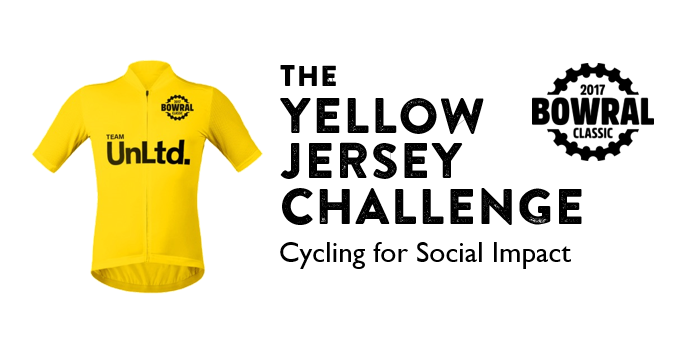 All bookings made by 31 July receive an UnLtd yellow jersey! Team UnLtd members can choose any of the 3 distances (45km, 120km or 160km). All Team UnLtd riders commit to raising a minimum of $1,000 through the Bowral Classic fundraising page (GoFundraise). UnLtd will cover the entry fees for the individual, however, should the minimum fundraising target of $1,000 not be met by 22 October 2017, the individual will need to cover the registration fee themselves (up to $240). To book your place, please email saarika@unltd.org.au to receive registration instructions and the discount code to access the free entry.